We were given the task to remodel a 1970s dilapidated factory and bring it in line with 21st century production thinking. 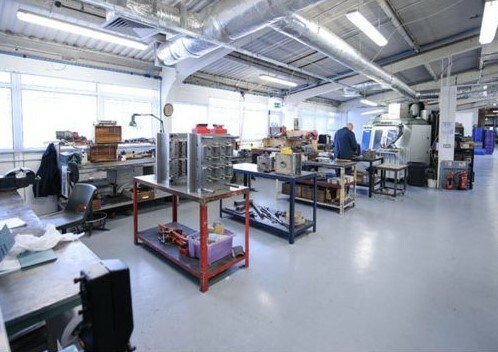 Pentagon Plastics is a plastics injection moulding manufacturer based in Horsham, West Sussex. It is a thriving company with a lot of potential as more and more businesses are sourcing British products to cut down on shipping costs among others. However its production plant dramatically let it down: built in the 1970s, it did not meet rigorous modern-day building industry standards. Health and Safety standards were not respected and the factory rooms and offices were dark, dingy and unhealthy. The roof was leaking and in places was exposed to the outside elements. We were brought in to create an uplifting working environment that was clean and professional-looking which would also cater for client visitations. 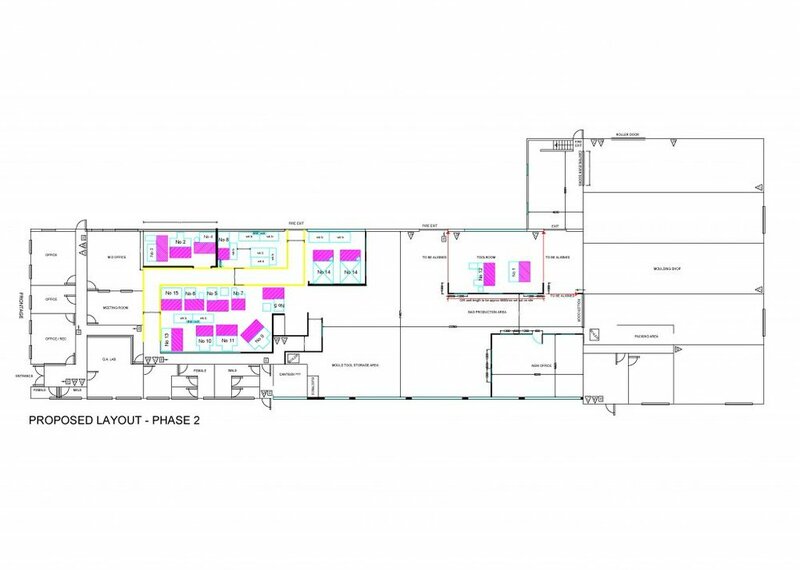 Reconfiguration of walls and remodelling of the building were urgently required. The first job was to measure up the whole factory as they had no building outline. We also had to measure up the plant machinery. Once completed the designer plotted all this information onto the CAD drawings so the client could then see how things were shaping up. Different elements were looked into: fire safety, lighting, flooring and wall decorations. Electrical layouts and electrical lighting layouts were produced and industry standards for fire safety (alarms and sounders) were met. After the client design drawings had been signed off, the builder sent in his quotation. Pentagon Plastics directors gave the green light to proceed with the work. The builder then applied for statutory building control. One of the most important aspects of this modernisation process was the reinstatement and upgrading of the heating and ventilation system for the building (M&E) as it was obsolete. A new roof was also installed as a first prerequisite, along with a fire sprinkler system. The MD’s office, the main reception area and all office areas e.g. meeting rooms were completely redesigned. In the factory safety walkways around machinery were worked out in accordance with Fire and Safety regulations. Inspection, packing, post moulding and storage facilities were transformed following Health and Safety procedures. We successfully created a visually engaging environment. 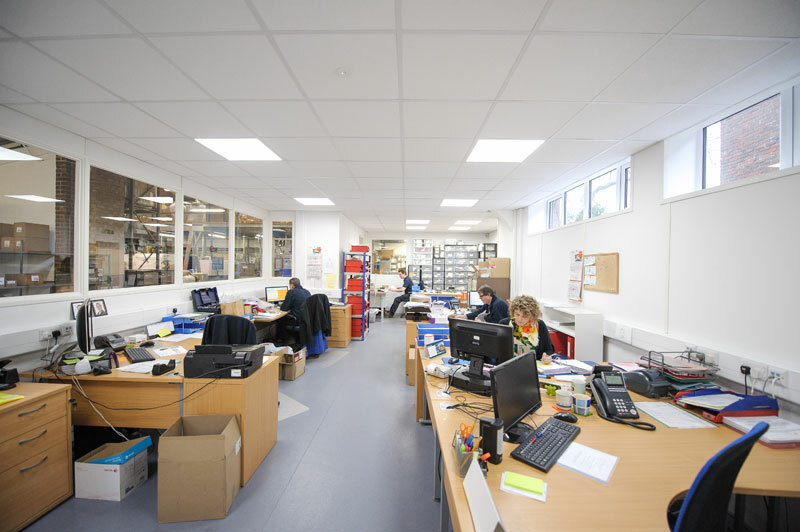 For example the on-site tool room is now housed in a vast, clean and modern environment allowing their engineers to enjoy their skilled work in a bright and well equipped environment. All factory rooms have got a light open feel. Manufacturing processes have been made transparent and customer confidentiality is respected. This has enhanced client relationships. Communication has been boosted at every stage. Pentagon Plastics factory and offices gained a new surge of life when the last building works were finalised. It’s now a thoroughly contemporary production area where people are happy and stimulated to do their best work and communicate effectively to each other. The future now looks bright for this forward-thinking company, all set to realise its full potential for years to come.